As well as exploring a lovely creek, this ride follows the heritage listed main outfall sewer, an interesting feature of Melbourne’s history. The ride goes from Albion Station to Hoppers Crossing Station. The ride initially follows Kororoit Creek through a landscaped linear park. 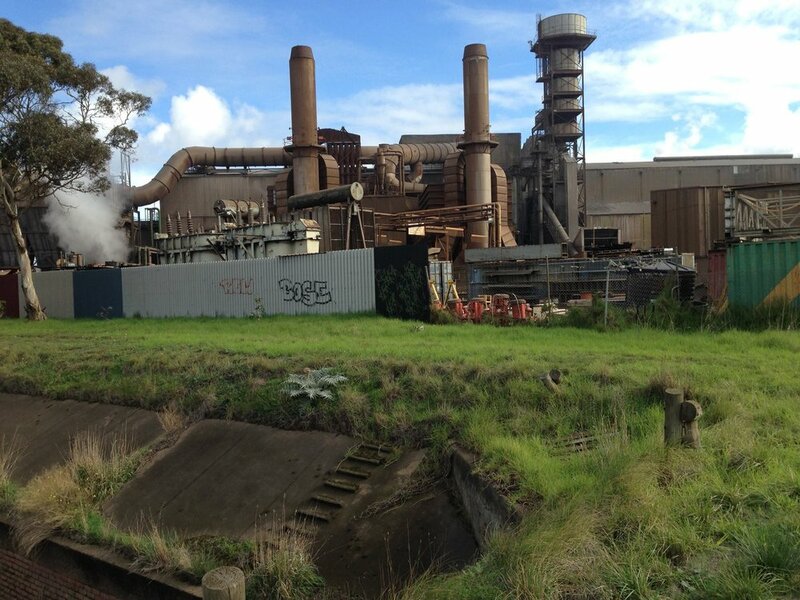 Towards the end of this segment, riders get a glimpse of industrial Melbourne. Turning right onto Federation Trail, the ride continues through this industrial area giving you the opportunity to ponder what lies behind our very comfortable modern lifestyle. After a while, the trail follows the main outfall sewer, a major engineering project of the 1890s. Made of brick and concrete, this now disused sewer carried Melbourne’s waste to the Werribee Treatment Farm. Greening the Pipeline is a project to develop the surrounds of the sewer into community parklands. You can see the first 100m of this at Williams Landing. The ride finally turns onto a short stretch of Skeleton Creek to finish near the Princes Hwy. Watch for snakes in summer. There is one cafe en route, Hungry Jays Cafe about 100m west of the trail in Dohertys Road. There are cafes and toilets at the end of the ride in Hoppers Crossing. The ride is fairly flat with some undulations. The ride starts on the west side of Albion Station. Cross Sydney Street and ride south west along Derrimut Street, heading diagonally away from Sydney Street. At the end of Derrimut Street, turn left into Selwyn Street. Turn left onto a path leading down to the creek ahead. At the creek turn left onto Kororoit Creek Trail. Follow this trail under Forest Street and the railway line and then turn right as the trail crosses the creek. Continue to follow Kororoit Creek Trail to Wright Street. Follow the trail under Wright Street when it turns right. Ride away from the creek to Bambara Court. Turn right onto Bambara Court and then right onto the shared footpath in Wright Street. Ride across the creek using Wright Street. Turn right to get back onto the Kororoit Creek Trail. Follow the Kororoit Creek Trail until it ends at Federation Trail. Turn right, to follow the Federation Trail as it travels southwest, under the Western Ring Road and beyond. You will cross a few roads. The trail takes a slight turn at Laverton Creek, to travel in a more southerly direction, towards Hoppers Crossing. Just after passing the playgrounds of Truganina South Primary School on your right, arrive at Skeleton Creek. Cross Skeleton Creek and turn left to continue on Federation Trail. Turn right on the trail as it follows Princes Hwy. The railway line is on your right, with the highway on your left. When you see Hoppers Crossing Station on your right just before Morris Road, you know that you have reached your destination. combining it with part of Werribee Exploration. Pick up the ride at Hoppers Crossing. combining it with The Western Ring Road. The two rides meet at Albion on Kororoit Creek. Exit on the east of Ginifer Station. Turn right and ride on the shared path on the right of St Albans Road for 850m. Just before reaching the Western Ring Road carefully cross St Albans Road and ride up to the M80 Trail (aka the Western Ring Road Trail). Turn right onto this path. Follow the M80 Trail for 1.4km to Jones Creek and cross the creek at the bridge before turning right to go under the Western Ring Road. Follow the path for 1.1km to Ballarat Road where you need to cross at the lights and pick up the path on the other side. You are now following the M80 Trail along Kororoit Creek. After 900m the path crosses Kororoit Creek on a pedestrian bridge. Turn left onto Kororoit Creek Trail just before this bridge. Follow Kororoit Creek Trail along the creek, up to Ballarat Road where it follows the road for 200m. Turn off Ballarat Road and follow Kororoit Creek Path to Albion. Follow steps 7 to 21 of the main ride above.